Find out why a guild member has defaulted on yet another contract in Bravil. Find Maglir and question him about the defaulted contract. Obtain ten samples of imp gall for Aryarie. Return to Aryarie and Modryn for your rewards. Speak with Modryn Oreyn to find out that your old friend Maglir has defaulted on yet another contract, this time in Bravil. You are to find out why once again. Travel to Bravil and ask around town or in the local Fighters Guild about Maglir and you'll be directed to The Lonely Suitor Lodge in town. 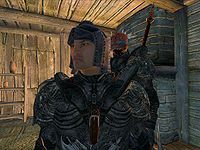 Once you locate Maglir and speak with him, he'll reveal he's defected to the Blackwood Company for work (as if his new armor wasn't a dead giveaway). If you covered for Maglir before, he'll tell you about Aryarie directly. If you dutifully told Modryn Oreyn the truth about Maglir's first defaulted contract he'll get quite upset with you, calling you a rat and refusing to speak with you any further. At this stage you can either return to Modryn Oreyn, who will tell you to talk to Aryarie, or speak directly with her in the Bravil Mages Guild for details on completing the contract. Aryarie needs ten samples of imp gall for her research and doesn't trust the Blackwood Company to do the job. She suggests Robber's Glen Cave as a likely place to find imps and marks the cave's location on your map. Robber's Glen Cave is one of the few places in the game where imps are always guaranteed to appear. You will find at least twelve imps in the cave, making it straightforward to fill Aryarie's request. As a monster dungeon, it also has good quality treasure and may be worth exploring even if you do not need the imp gall. It is located north of Bravil on the Green Road. However, you do not need to visit Robber's Glen Cave to complete this quest, as any imp gall will suffice. If you already have ten samples in your inventory, you can immediately give them to Aryarie. Or you can visit any of the other places detailed on the relevant article to obtain the necessary samples. If you are the Arch-Mage and already have a sample, you can use the enchanted chest in the Arch-Mage's quarters to quickly get ten. Return to Aryarie to receive a leveled Ring of Aegis, which has a constant Shield enchantment. These rings are available at a much lower level (4 levels lower) than anywhere else in the game. Return to Modryn Oreyn for the rest of your reward: a standard level-dependent gold reward, one Fame point, and advancement to the rank of Defender. Now that you have finally earned some of Modryn's respect, he will suggest it's time to talk about the Blackwood Company, which leads to your next Fighters Guild quest for him - Azani Blackheart. 10 Modryn Oreyn has told me to go to Bravil and find out why Maglir has defaulted on another contract. 20 I've been told that Maglir can be found in the tavern at the Lonely Suitor Lodge. 30 Maglir tells me that he is no longer a member of the Fighters Guild. He is tired of trying to scrounge up work, so he has joined the Blackwood Company. 40 Aryarie at the Mage's Guild has told me she is glad someone from the Fighters Guild is going to fulfill her contract. She was unwilling to hire the Blackwood Company, as she disliked their reputation. She would like me to find 10 portions of imp gall, and suggests Robber's Glen Cave might be a good spot to hunt for it. 50 I have found 10 portions of Imp Gall. I should bring them to Aryarie. 60 Aryarie was pleased with the Imp Gall I brought her. As an extra reward, she's given me a Ring of Aegis. I should return to Oreyn. 100 Finishes quest Modryn Oreyn was disturbed by the news about Maglir, but was glad that I was able to complete the contract. It is possible to use the console to advance through the quest by entering setstage FGD04Defector stage, where stage is the number of the stage you wish to complete. It is not possible to un-complete (i.e. go back) quest stages. See SetStage for more information. Esta página foi modificada pela última vez à(s) 07h01min de 31 de dezembro de 2014.